Beacon Falls, CT – August 13, 2015 – "It was a workhorse - a really good piece of equipment - but after the 15-year mark, we decided to switch." That’s Tom Daskalakis, Vice President and Chief Operating Officer, University of Cincinnati Health system (UC Health), speaking about a recently replaced 14-module tunnel washer from Lavatec Laundry Technology, Inc..
UC Health owns Midwest Laundry and, in turn, the equipment providing clean linen for the system’s hospitals and others in the tri-state southwest Ohio-northern Kentucky-southeast Indiana area. "We’re the region’s only ‘academic’ health system providing high acuity care," Daskalakis points out. UC Health includes four entities: University of Cincinnati Medical Center, West Chester community hospital, Drake Hospital (a long term care facility), and UC Physicians, which employs about a thousand providers. Midwest Laundry processes over 15 million pounds of linen each year, about one-third of which is for UC Health’s own facilities. The balance of goods comes from other area hospitals as far north as Dayton, OH, over 120 clinics, eight senior living centers and several hospitality operations. Built in 1990, the 45,000 sq. ft. facility also houses a 20-year-old Lavatec tunnel, and 85 employees turn out clean linens for timely deliveries seven days a week. A key partner in this scenario is Sodexo, a $16.6 billion global corporation and the world leader in Quality of Life Services (food service, environmental services and facilities management), which include laundry and other health care operations. Sodexo manages Midwest Laundry, a for-profit arm of UC Health, as well as similar facilities in about a dozen U.S. cities, coast to coast. Jim Byrnes, District Manager for Sodexo Laundry, reports that "we have Lavatec equipment in most of them. It seems to be simpler with fewer moving parts than others and it works very well." Nevertheless, despite being the incumbent brand and 2-1/2 decades of noteworthy service, Lavatec wasn’t a shoo-in for the new tunnel – far from it. "All manufacturers have their own unique programming and features," Byrnes points out. "We’re responsible to our clients, in this case UC Health. Our task is to find the best match for its ongoing customer needs." Steve Roark, Sodexo’s Client Relations Manager, concurs. "We’re here to protect and enhance UC Health assets – not only physical, in terms of equipment, but also their reputation along with Midwest Laundry’s. We’re like a ‘silent partner.’"
Sodexo requested competitive tunnel system bids, did due diligence and narrowed it down to three systems, including Lavatec’s. "We pushed them to the top level at UC Health, with our recommendation, for their final decision," Byrnes says. Several factors figured strongly in UC Health’s choice, Daskalakis notes, one being the "history of the current service" extending beyond performance of the 15-year-old Lavatec tunnel itself. "Parts availability and service: we’ve had no issues with getting parts or timely response from Lavatec over the years. Although Lavatec is a German-based company, they provide easy access to what we need in the U.S."
This contributes to overall vendor reputation, another key factor for UC Health, along with cost of equipment and ease of installation. Another LP 572 press, for Midwest’s second Lavatec tunnel, also was part of the overall project. Once the decision was made, Sodexo and Lavatec moved quickly, globally as well as locally, to make it all happen. The new tunnel washer itself was on its way from the Lavatec plant in short order, largely due to Laser-Guided Drum Manufacturing. This automated robotic welding method not only provides tighter tolerances, uniform welds and stronger, tighter, longer-lasting seals, it speeds up tunnel construction and delivery time dramatically. Meanwhile, at Midwest Laundry, "planning and preparation was the key," asserts Sodexo’s Byrnes. "We relied on Lavatec and their experience for much of it. They identified the time frame and what we needed to do internally to make sure our customers didn’t experience any downtime or service blips at all." Step one, in terms of actual installation, was bringing in the new LP 572 extraction press for the 15-year-old Lavatec tunnel. "They did that over a weekend," reports Byrnes. "This helped tremendously in keeping goods moving during the transition. Compatibility of the new press with our older tunnel as well as Lavatec’s new tunnel technology is a real plus." Next came the big switch: dismantling and removing the old tunnel and covering the same footprint with the new unit … right through the wall separating the facility’s soiled and clean linen processing areas. At the same time, crews also removed and replaced other old system components, including five dryers and a conveyor, all while Midwest continued to process and deliver about 50,000 lbs. of clean linen daily. See time-lapse video of the "out-with-old, in-with-new" process for Sodexo and UC Health at Midwest Laundry, a brief film (2:41 min.). on maintaining service during a major renovation. Sodexo’s Roark notes "we were running 24 hours, seven days a week" with the other Lavatec tunnel, and offset some goods to another facility, "to ensure that all linens were pushed through in a timely manner." Pressure began to ease a bit on the eighth day, when "we did a soft start with the new tunnel," Byrnes reveals. The pace picked up quickly and, with the LP 572 press, a two-cake shuttle and five-dryer bank in place, the new system was in full swing. Midwest Laundry staff were universal in their praise of the transition process, including Production Manager Jim Robinson: "It went so smoothly and so quickly, we were done and producing and customers would say ‘What? You had a new machine come in? We didn’t miss a thing.’"
From Harley Caum’s perspective as Chief Engineer and Maintenance Supervisor, "We were able to keep up with demands by running the other tunnel 24/7 for about seven days. 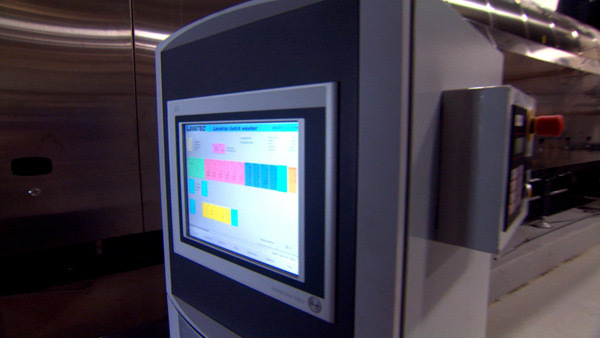 By then, the new system was pretty much ready to go." Observes Sodexo’s Roark, "We worked through those 10 days without customers even knowing that the process was being performed." "Not knowing" also includes Daskalakis. "I wasn’t exactly sure when the tunnel itself was going in," he reveals. "I called Jim (Byrnes) to ask and he said ‘we’re almost done; we’re in the eighth day now.’ That’s how smoothly it went." Those "reductions in tangibles" Daskalakis was anticipating haven’t been far behind. "We compared water meter readings to this time last year," reports Byrnes. "There was at least a 20% reduction in water usage the first month alone." "We expect great utility savings," asserts Daskalakis, "with all tunnel system components contributing." The hydraulic press, according to Caum, "pushes a lot more moisture content out – which means less time in the dryers." The dryers themselves are equipped with multiple-phase temperature controls and infrared sensors that "really help a lot on energy efficiency. They cut our dry times by 10 minutes or more per load." Even at full dryer capacity (292 lbs., each), with the laundry processing about 50,000 lbs. of linen daily, it translates into 28.5 fewer hours of drying time and energy savings. Adds Byrnes, "For some items, dry times have been cut in half. For sheets, it’s just a fraction of what it used to be, because you want to leave them a little moist before going through the ironers. In fact, after the press, there’s little reason to put sheets into dryers other than to break the cake." "The name of the game in health care is to provide outstanding quality at the lowest possible cost," notes Daskalakis. "Laundry is a key cost component, and this system definitely helps." Midwest Laundry hosted an open house for customers recently, a chance for all to see the new Lavatec system in action. For UC Health, Sodexo and Midwest people, it was also an opportunity to reflect on the magnitude of their collaborative accomplishment with Lavatec Laundry Technology. "They were able to get the old tunnel removed, the entire new tunnel system in, up and running within 10 days," remarks Sodexo’s Byrnes. "They worked with us to keep everything under budget, including additional equipment. And no one was really affected at all in terms of linen deliveries." Sums up UC Health’s Daskalakis, "From an owner’s perspective, it was seamless." 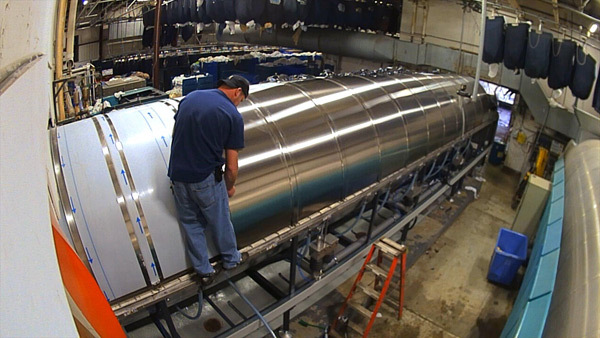 Sodexo and University of Cincinnati Health system (UC Health) zeroed-in on this 14-module tunnel washer from Lavatec Laundry Technology to anchor processing of more than 15 million pounds of linen annually at Midwest Laundry. 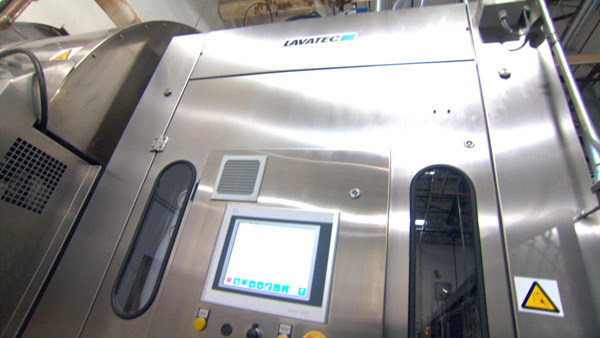 Midwest Laundry’s 15-year veteran tunnel washer gave way to an all-new Lavatec 14-module system. Removal of the old tunnel and installation of the new system (tunnel washer, extraction press, two-cake shuttle and five dryers) was completed in 10 days. 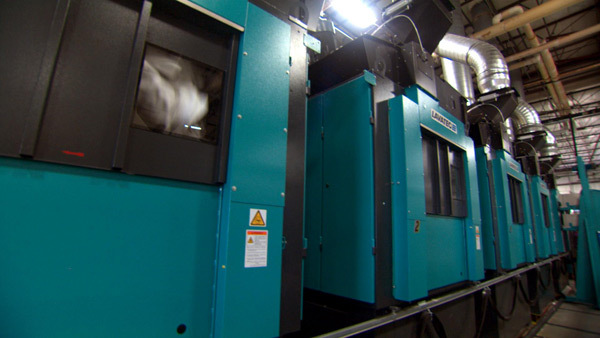 Five TT 745 natural gas dryers are part of Midwest Laundry’s new Lavatec tunnel system. Early reports from Sodexo and UC Health say that dry times have been reduced by half (or more) for many linens – with significant energy savings – largely due to the dryers’ multiple-phase temperature controls and infrared sensors. Two new Lavatec LP 572 extraction presses play key roles in boosting productivity while reducing costs for UC Health’s Midwest Laundry operation. The units’ 40-bar hydraulic pressure turns out linen cakes with unprecedented speed, and their moisture removal also helps cut drying times significantly.